Oculus Rift DK2 is one of the most popular 3D Glasses/Headsets with its low-persistence OLED display and low-latency positional head tracking. More and more people start to choose Oculus Rift DK2 when they plan to get a 3D Glasses to enjoy 3D movies at home. For Oculus Rift DK2 owners, when you have a Oculus Rift DK2 in hand, do you think about the 3D movie source? Download from 3D YouTube site? Have you imaged that you can make 3D content for your Oculus Rift DK2 by yourselves with your DVD/Blu-ray collection and other movie library? Want to know how to get it? OK, just read on the article and you will get the great solution. I think that you should know clearly that if we want to watch 3D movies on Oculus Rift DK2 with all kinds of movie sources, we have to need a third party software named video converter, which is designed to convert your source video to 3D Mode. But considering that the source video maybe contain DVD/Blu-ray, which have complex encryption even region codes, the consideration about the video converter must be careful. 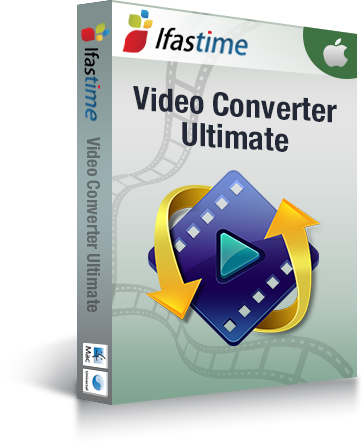 Here, I strongly recommend iFastime Video Converter Ultimate for Mac for you guys. This powerful and integrated video software combines all the functions of Blu-ray Riper for Mac + DVD Ripper for Mac + Video Converter for Mac, which means it can transform protected and region-locked DVD/Blu-ray and other 4K/SD/HD video in any formats to Oculus Rift DK2 on Mac with excellent 3D effect. If its 2D to 3D conversion function doesn’t attract you. It also enables you to adjust 3D effect and reset the output video size to get better 3D movies for Oculus Rift DK2. Windows users should turn to the equivalent Windows version and Mac users please get freely the app at below and follow the steps to make 3D movies for Oculus Rift DK2. How to get 3D content for Oculus Rift DK2 on Mac? Launch the top 2D/3D to 3D converter for Mac and add your movie source by clicking the "Load file(s)" or “Add videos” icon to import videos to the app. Oculus Rift DK2 supports MP4, MKVI, etc format. 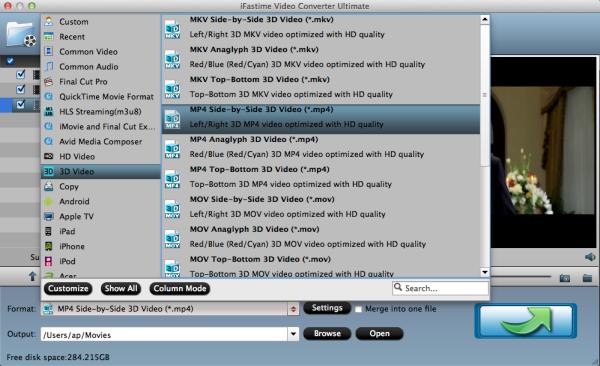 You can click the "Format" bar and choose "MP4 Side-by-Side 3D Video (*.mp4)" or "MKV Side-by-Side 3D Video (*.mkv)" from "3D Video" profile list for your Oculus Rift DK2. Note: For getting better 3D experience for Oculus Rift DK2, you should adjust the video size and bitrate here. Clicking the "Settings" button, for common videos, 1280x720 HD resolution and 5 Mb/s video bitrate are recommended. 1920x1080 compressed side-by-side 3D should be resampled to 1920x540 resolution full side-by-side resolution. The last step is to press the big "Start conversion" button on the right to start converting all videos to Oculus Rift DK2 on Mac. The conversion takes a few minutes, if you don't have time to wait, you can choose "Shut down computer after conversion". Then your computer will be turned off automatically after the conversion is finished. Now, click here to learn how to transfer 3D movies to Oculus Rift DK2 for watching. When you have an iFastime Video Coverter Ultimate, you never need to worry about no 3D movies for Oculus Rift DK2 to play. 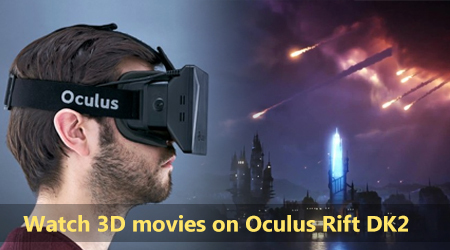 Have more questions about how to watch 3D movies on Oculus Rift DK2, please feel free to contact us>>.